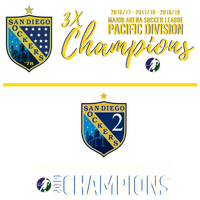 The San Diego Sockers are the most successful indoor soccer team in the sport’s history. The team has won a total of 14 indoor championships in the MISL, PASL and MASL leagues combined. Also, the Sockers also set a U.S. pro sports record with the longest winning streak boasting 48 straight wins.